wormholes concerned me. 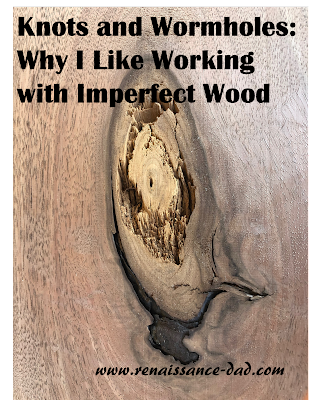 I really hoped that I was not introducing a colony of termites or other wood-consuming insects into my workshop. As I recently started to work on a project (spoiler alert - while I'm not saying what I'm working on yet, there will be an article coming up [if the project turns out]. However, you can follow the progress on the Renaissance Dad Facebook page), I came across several boards with some of these blemishes. As I evened out the boards and planed them down, some of the rough spots were removed. But several of the wormholes and knots remained. And then I realized something. I love these blemishes. First of all, the knots and wormholes are all unique. Just like fingerprints, they make each board special. Yes, you can argue that the grain patterns in the wood are also unique, but I really like the character added to the boards by the wormholes and knots. Second, each of these components has a story. Without getting too Aristotle-like, it is fascinating to me to think about what was going on in the world when each branch sprouted that eventually became that knot. Was I even alive when that particular worm moved through that particular board and chewed that particular hole? Just like the antique tools that I own, each blemish has a story, and those stories all come together to add character to the board. Finally, when I wrap my mind around the fact that each blemish adds character, it helps me realize that there is no such thing as a perfect board. 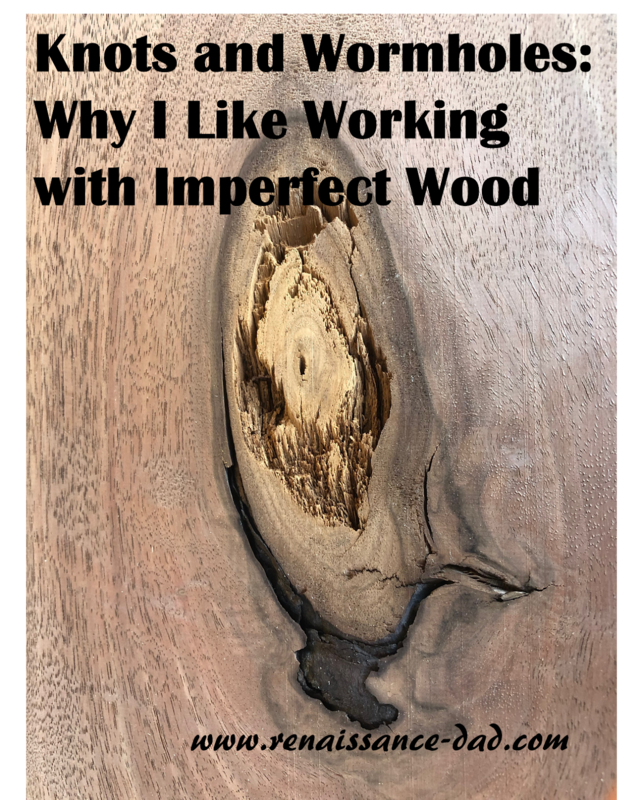 If there is no such thing as a perfect board, then I am released from the pressure of making a perfect project. While I will still do the best that I can, each wormhole reminds me that things will happen to my furniture that are out of my control, and that is okay. Dents, nicks, and scratches will find their way onto this piece, but I don't need to worry about it because some worm in the past beat my kids to it and damage the wood long before they existed. So as long as there are no hidden eggs waiting to hatch in my living room while I'm sleeping, I'll take the knots and the wormholes and appreciate them for the uniqueness they bring to my work. I'm sure there's a metaphor about life in there somewhere, but I can't quite put my finger on it.